The Green Scene in Chatsworth, CA. Choosing a DesignChoose a fireplace design that fits in scale with the size of the yard and home. 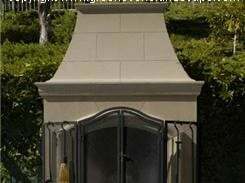 I often look to the architecture of the main home for details to replicate on my fireplace. Is there stone or stucco on the house that we can match? Architectural elements that I can bring down into the shape of my mantle or chimney? For help with fireplace design ideas visit The Concrete Network's backyard fireplace photo gallery and browse through hundreds of outdoor fireplace perspectives. Chimney ConsiderationsWood burning outdoor fireplaces create a lot of smoke. Code requires that chimney height be 2 feet taller than adjacent structures like patio covers and homes, so plan accordingly. Getting a fireplace to draw properly outdoors has its challenges. Indoors you control the air flow and fireplace chimneys draw easily due to buoyancy (action of the hot smoke rising in the flue because it weighs less than cool air). Outdoors the slightest wind can downdraft your fireplace and force smoke forward of the hearth. To reduce this, a "smoke shelf" must be designed into all wood burning fireplaces, your flue sizing must be calculated properly, and chimney height must be tall enough to encourage proper draw. Do the math! Pay close attention to sizing charts that dictate proper proportion of firebox opening and flue size requirements. Gas Only or Wood Burning Fireplaces?When a client decides they want to have a fireplace in the yard, the first consideration I have is "what type"? Do they want to burn wood logs or only faux logs with a gas flame. When a client decides they want to have a fireplace in the yard, the first consideration I have is "what type"? Do they want to burn wood logs or only faux logs with a gas flame. The construction and code requirements vary substantially between the two and in some fire-hazard communities they do not allow wood burning features near slopes, or at all. Wood burning fire features require a "spark arrestor" to reduce hot sparks from accidentally igniting your neighbor's home. Check local zoning and building codes before you start. Some communities do not allow wood burning fireplaces. Placement of an Outdoor FireplaceZoning guidelines vary from city to city, but most restrict how close you can construct a fireplace to the existing home, and have side and rear property line setback guidelines. Additionally, many communities have even more rules with regards to slope setbacks and height restrictions of taller structures on view lots. Be sure and check with the local City Planning Office to confirm acceptable locations of your outdoor structure before you get too far along on your designs. I like to break up outdoor garden space into "rooms" or "zones" for entertainment and the outdoor "Living room" is where I typically situate my fireplace structure. Consider views from the house, focal points, privacy, screening and prevailing wind (direction that wind blows from most often) when deciding where to set this large permanent structure. I think of the fireplace as an "anchor" for the outdoor living room. Keep in mind that this large structure will alter the flow of traffic thru the garden areas, so design accordingly. Place fireplaces in a focal point, but do not block city or mountain views. Use the height of a large fireplace to help screen prevailing winds. Seating ConsiderationsPatio areas adjacent to fireplaces should be big enough to accommodate today's larger "deep seating" style outdoor patio furniture, but not so large that they don't allow for some adjacent plants and flowers. Most home-owners want a couple of couch style or large lounge chairs next to their fireplace. I always do my best to balance softscape and greenery with my hardscape requirements. Outdoor living room patios should be large enough to accommodate typical furniture layouts and a walk-about pathway, but not much larger. This allows more room in the garden for some actual greenery. 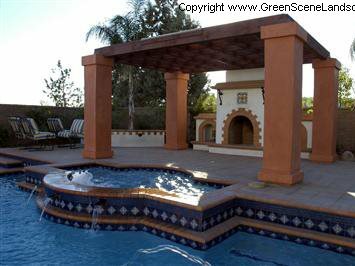 Plan on adjacent patio sizes with a minimum area of 12 feet by 12 feet and a maximum of 18 feet by 18 feet..
Use furniture templates drawn to scale to help layout patio sizes.